Spain’s third-largest city is located in the middle of the huerta: a fertile plain of orange groves and market gardens, which is one of Europe’s most intensively farmed regions. It’s here in Valencia where you’ll find the world’s most sublime orange juice, and the origins of Spain’s infamous paella, as nearby rice paddies offer the country’s top notch source for the one-pan feast, locally prepared with rabbit, chicken and snails. With its warm coastal climate, Valencia is known for its exuberant outdoor living and nightlife. In March, the city stages one of Spain’s most spectacular fiestas, La Fallas, in which giant papier-mâché sculptures are burned in the streets. 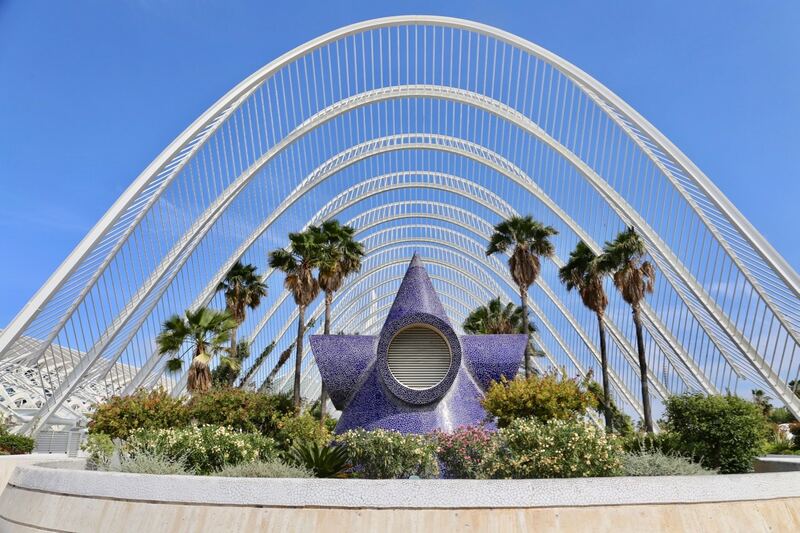 Today, Valencia is best known for its out-of-this-world architecture, thanks to the futuristic complex, City of Arts and Sciences, designed by local architect Santiago Calatrava. The city’s harbour is also a launching pad for ferry services that connect the mainland to the Balearic Islands. 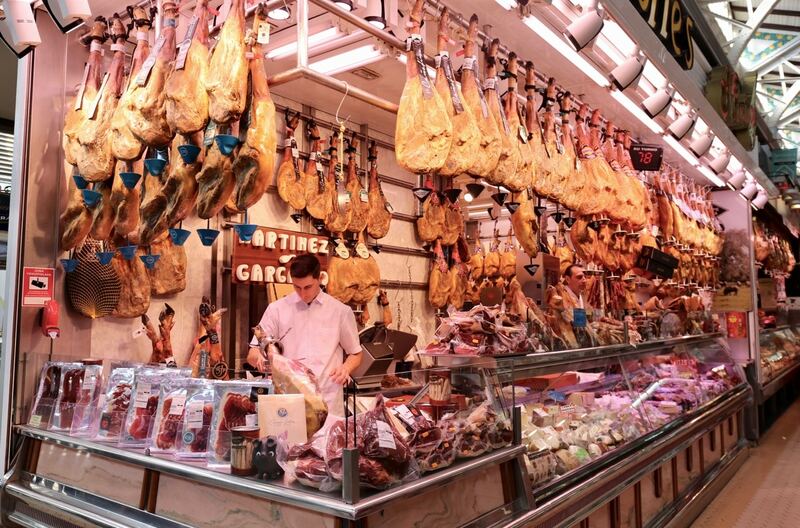 Valencia’s Mercado Central is one of Spain’s most adored food markets. This huge iron, glass and tile Art Nouveau building, with its parrot and swordfish weathervanes, opened in 1928 and is one of the largest and most attractive markets in Europe. Every morning its 350 or so stalls are filled with a bewildering variety of food so if you’re planning a pretty picnic it’s an excellent spot to source local delicacies. Hop up at Central Bar by celebrated Chef Ricard Camarena and you’ve found the markets most buzzed about destination, where a glass of ice cold draught beer pairs perfectly with crispy croquettes. 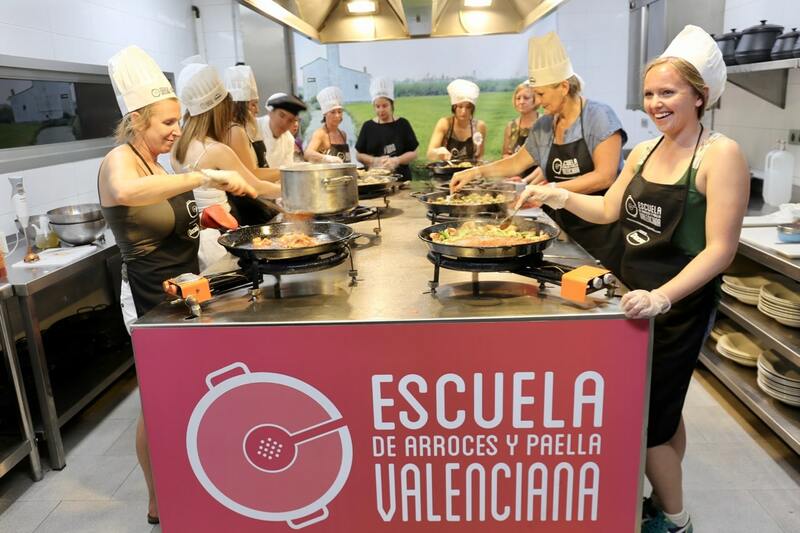 If you’re keen to learn the secrets to making the perfect paella in Spain there’s no better place than the School of Rice and Valencian Paella. The class begins at Mercado Central, where a friendly guide zips around the market purchasing all of the ingredients you’ll need to make your paella that day. They do a great job at explaining the importance of each ingredients so students at the cooking school know how to purchase the right stuff when back at home (don’t skimp on the saffron!) Back at the cooking school you’ll work alongside a hilarious chef who breaks down paella’s preparation, step by step. The final product is enjoyed as a celebratory feast alongside fresh salads, classic tortilla, and fine wine. Built originally in 1262, Valencia Cathedral has been added to over the ages, and its three doorways are all in different styles. The oldest is the Romanesque Puerta del Palau, but the main entrance is the 18th-century Baroque portal, the Puerta de los Hierrors. A unique court meets on Thursdays at noon in front of the Gothic Puerta de los Apostoles. For about 1,000 years the Water Tribunal has settled disputes between farmers over irrigation in the huerta. Inside the cathedral, a chapel holds an agate cup, claimed to be the Holy Grail and formerly kept in the San Juan de la Pena. Behind the main altar are some 15th-century frescoes. The cathedral’s bell tower, the Miguelete, is Valencia’s main landmark and popular for the views it offers from the top. 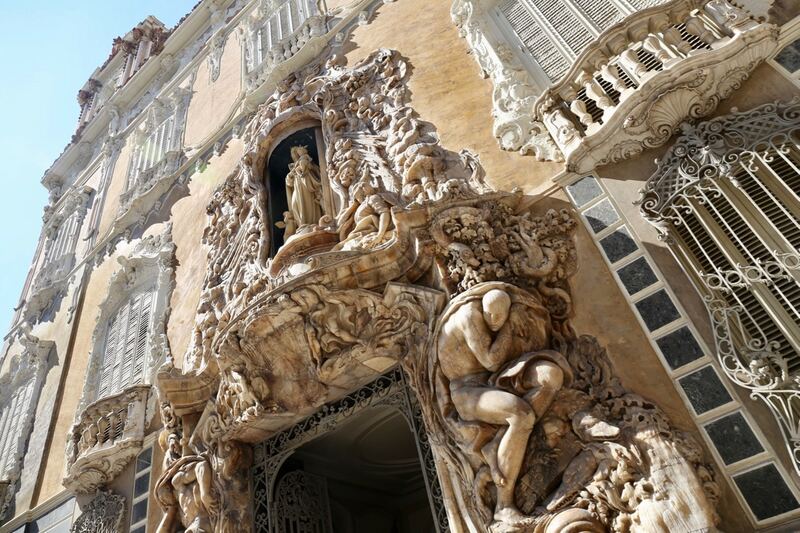 Valencia’s most fascinating facade is a full-on celebration of Rococo, found at the Palace of the Marques de Dos Aguas. The noble palace was considered in Valencia for centuries, as a paragon of nobility and opulence. It’s impossible to walk past the palace without stopping in stunned silence at the elaborate alabaster sculptures which frame the principal entrance. A statue of Our Lady of the Rosary stands above the door, while two rivers (symbolizing the “Dos Aguas” of the family’s title) cascade down either side of the niche. Closer to the ground, two buckled-over giants are supporting an intricately decorated scene of trees, leaves, fruits, animals, the family crest and abundant waters. 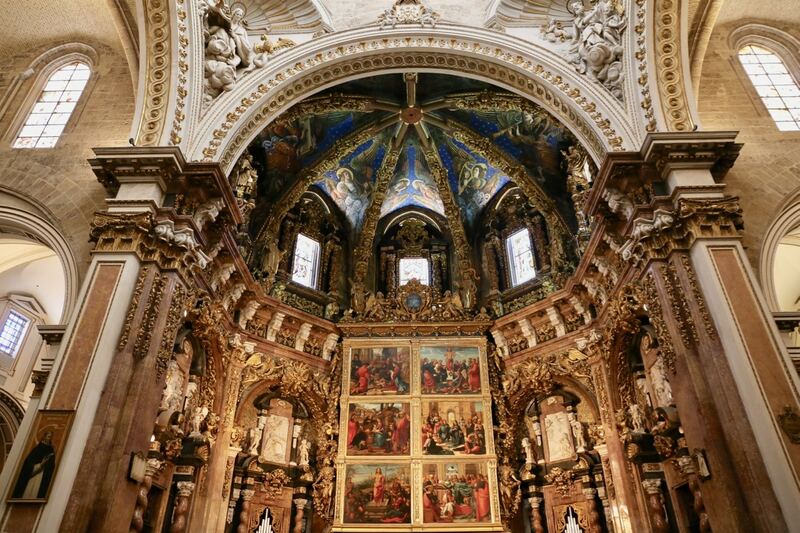 The Church of Saint Nicholas is dubbed by locals as “Valencia’s Sistine Chapel.” Step inside and you’ll find jaw-dropping ceiling frescoes which were designed by Antonio Palomino in 1694 and realized by his pupil Dionis Vidal in 1704. The colourful paintings were designed in the baroque style and depict the life of Saint Nicolas. Having just recently undergone a years-long restoration, the church is now a not-to-be-missed masterpiece. El Carmen forms part of Valencia’s old city, located a short stroll from the city’s famous twin towers. Today the neighbourhood is best known for its hipster vibe. There’s not another area of the city where you’ll find a punk bar, reggae smoking den, retro chill-out lounge, jazz basement, underground trance club, gay bar, and bohemian art cave all on one street. 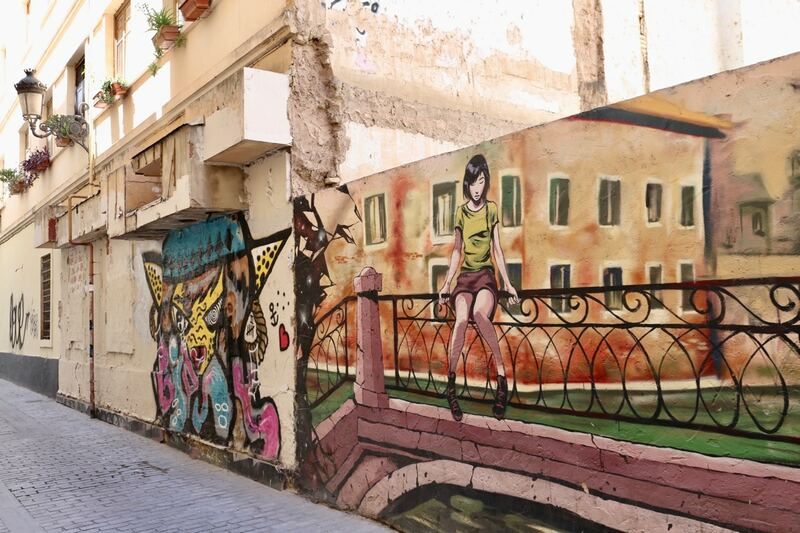 For travellers who have a keen eye for street art, El Carmen is a perfect spot to wander in search of gorgeous graffiti. 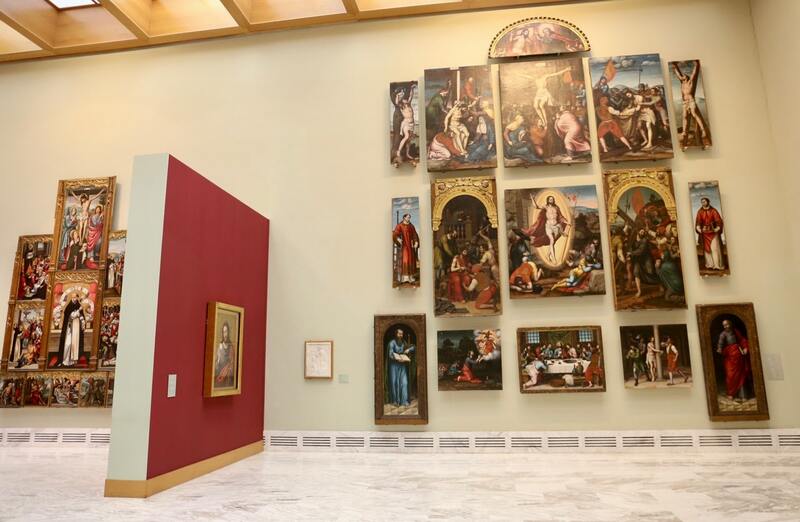 The Museo de Bellas Artes offers an important collection of 2,000 paintings and statues dating from the 14th to the 19th centuries. 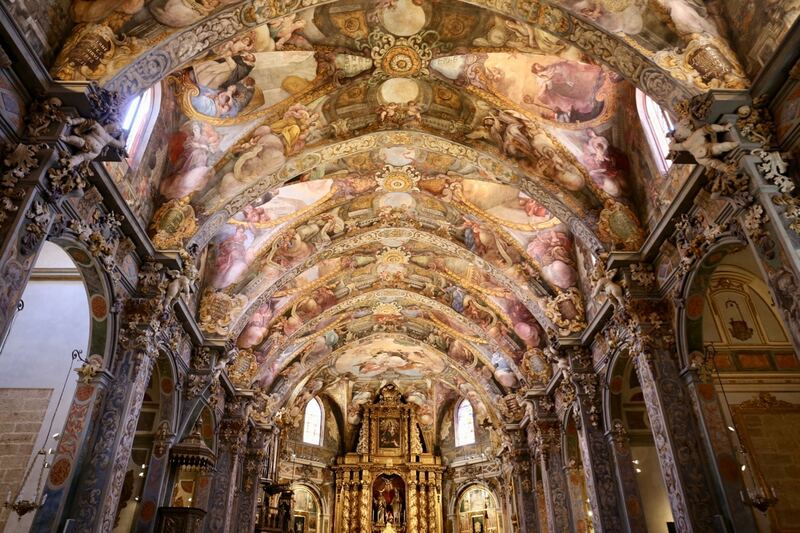 Housed in a former seminary which was built between 1683 and 1744, the city’s free Fine Arts Museum focuses on Valencian art represented by a gallery of golden altarpieces, a stunning self portrait by Velazquez and works by Bosch, El Greco, and Goya. 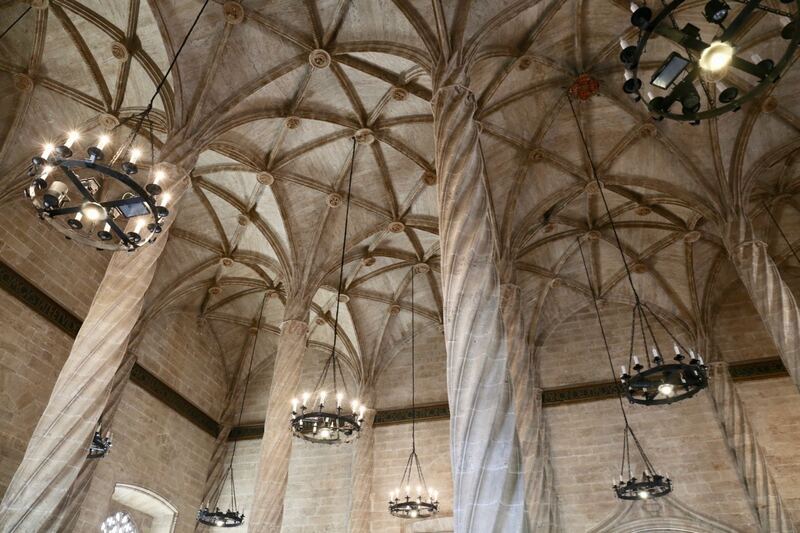 La Lonja is an exquisite Late Gothic hall, built between 1482 and 1498 as a commodities exchange. Also known as The Silk Exchange, its outside walls are decorated with gargoyles and other grotesque figures while the ceiling of the transactions hall features star-patterned vaulting, supported by stunning spiral columns. 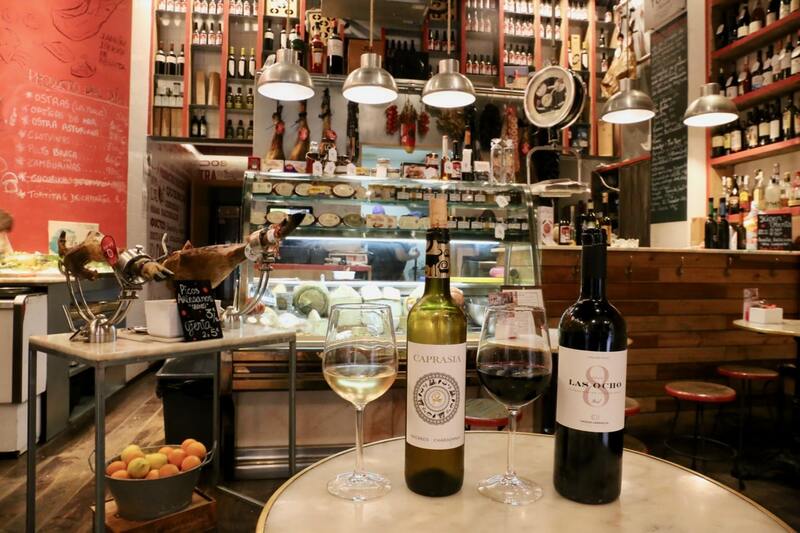 Located directly across from the main entrance to the Valencia Cathedral, El Colmado La Lola offers a perfect perch for those looking to sip fine Spanish wine and nibble on tiny tapas. You’ll find a selection of reasonably priced wines (less than 2 Euros a glass) which are best enjoyed while feasting on crispy croquettes, bite-sized patatas bravas, and a selection of local cheese and marinated olives. The futuristic complex of the City of Arts and Sciences stands at the seaward end of the Rio Turia Gardens. It is made up of five stunning out-of-this-world buildings, four of which were designed by local architect Santiago Calatrava. I suggest wandering here during the day as well as at night, as the vibe changes considerably. When the hot sun splashes across the city you’ll find tourists strolling through gorgeous gardens, and hiring stand-up motorized paddle boards which zip across the complex’s bright blue pools. At night when the city cools down it’s a perfect place to enjoy a romantic stroll, as each building illuminates across the night sky, making you feel as though they are secretly space ships quietly anticipating a launch into the cosmos. In March, the city stages one of Spain’s most spectacular fiestas, La Fallas, in which giant papier-mâché sculptures are burned in the streets. 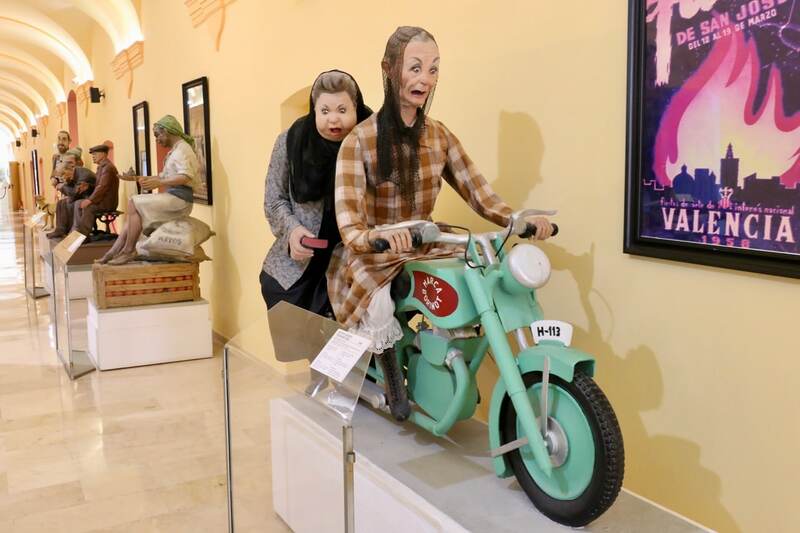 For those keen to tap into the tradition year-round, Valencia’s free Museo Fallero does an excellent job at showcasing the artistic works from past parades. Stroll through two floors of sculptural hilarity as Spain’s top artists share larger-than-life giggle-worthy scenes. Situated in the stylish district of Ensanche, on the site of the former Marqués de Campo gas factory, the bustling Mercado Colon plays host to a handpicked selection of food stalls, cafes, and high-quality shops. In addition to its tremendous eating, drinking, and shopping opportunities, it offers visitors a true architectural spectacle, one that convincingly combines its rousing Modernista design with contemporary aesthetic restorations. 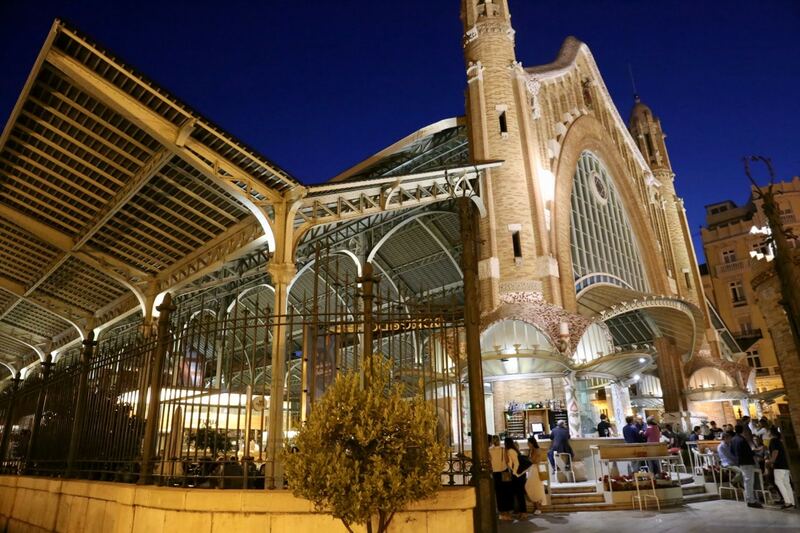 Built between 1914 and 1916 by local architect Francisco Mora Berenguer, the Mercado Colon went through a major refurbishment project that completed in 2003. Of major interest are its colourful Gaudi-inspired façade, the ubiquitous decorations depicting scenes from Valencian country life, as well as the elegant stalls and shops that sell everything, from fresh fish, meats, and delicatessen products to fruits, vegetables, flowers, and ceramics.